The Gillette Fusion Razor provides advanced 5-blade technology that helps reduce pressure per blade for a comfortable shave – even on sensitive skin. 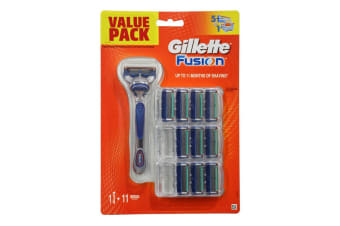 The Gillette Fusion Razor features precision trimmer that precisely trims tricky spots such as sideburns, under the nose for facial hair styling. The Flexible Comfort Guard features 5 microfins that follow the contours of your face for a comfortably close shave. It includes an indicator lubrication strip which fades to white when the shaver is no longer optimal to use.